This article is about a part of an animal used as food. For the Japanese dish, see Donburi § Tendon. The tendons of certain meat animals (particularly beef tendon) are used as a food in some Asian cuisines, including the Chinese, Japanese, Korean, Indonesian, Thai and Vietnamese traditions. Tendon is tough and fibrous prior to cooking, but becomes soft after a long period of cooking. In some cases it may be boiled, for as long as eight hours, while in other dishes it is prepared by deep frying. It contain large amounts of collagen, and after boiling or stewing, it is sometimes described as mimicking the mouthfeel of high-fat cuts of beef despite its low fat content. One author described the taste of deep-fried tendon as being similar to chicharrón (fried pork belly). Indonesian mie kocok noodle dish uses pieces of beef tendon. One popular Chinese dish is suànbào niújīn (蒜爆牛筋), where the tendon is marinated in garlic; it is often served at dim sum restaurants. In Japanese cuisine, beef tendon (gyū-suji) is a common ingredient in oden. Among several Korean menu, togani anju (도가니 안주) or boiled beef tendons is appreciated as snack with beer. There is a Thai cuisine steamed beef soup called Guay tiew nuea, and noodle, or toon, is added to the dish. In Indonesian cuisine, bakso urat is beef meatball filled with pieces of tendon, while soto kaki is spicy cow's trotters soup which includes cow's leg tendons. Another dish is mie kocok which is noodle dish with meatballs, beansprouts and pieces of beef tendon. 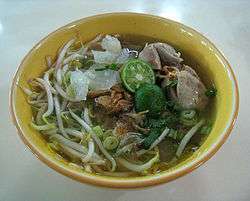 In Vietnamese cuisine, it is often used in pho. 1 2 3 O'Neil, Erica (11 August 2010). "Beef Tendon". Phoenix New Times. Retrieved 15 October 2015. ↑ "Hot food: Beef tendon". Sydney Morning Herald Good Food. 28 April 2015. Retrieved 15 October 2015. ↑ Lin, Eddie (6 March 2013). "Puff, Puff, Tendon: A Contemporary Crunch at Lukshon". Los Angeles Magazine. Retrieved 15 October 2015. ↑ "Braised Tendon with Scallions: Chinese Recipe". Chinatown Online. Retrieved 15 October 2015. ↑ "A hodgepodge that really hits the spot". Japan Times. 25 November 2001. Retrieved 15 October 2015.